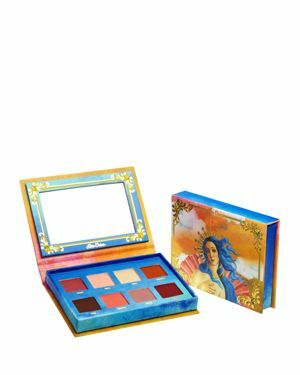 The Lime Crime Venus Palette has 2 editions: Venus (which I’m discussing in this post) and Venus II. Both palettes include 8 pigmented shades with a variety of finishes. I originally went for Venus because of the combination of muted and shimmering browns, reds, ivory, pink, and orange. The browns and reds are rusted, giving you color you didn’t normally find in an eyeshadow palette, until recently. Since this palette came out, I’ve seen more and more similar to it. I’ll say it, Lime Crime did it first! Â What it does: Inspires you to create your own masterpiece! Reinvigorates your eyeshadow routine by introducing rusty browns and rustic reds to your arsenal. Create a wide range of grunge-meets-renaissance modern looks, from a daytime wash of color to a night-on-the-town smoky eye. What it won’t do: Fade or fall out. Make you look the same as everyone else. I purchased this palette from DollsKill.comÂ for $34.00. This palette is also available online at Bloomingdales.com , LimeCrime.com, and Revolve.com . Take note: the palette is $37.00 on Revolve.com. The 8 cruelty free and vegan shades presented in this palette give you the option of creating opalescent daytime looks or dark and grungy nighttime smokiness. The wash of color these eyeshadows easily allow you to apply to your lids is heavily pigmented, and I’ve found it to stay that way all day long. That’s especially impressive to me because I have oily lids. These shades require lots of blending, but they do blend together beautifully, giving you the opportunity to create gorgeous eye makeup looks. I really love the shades Venus, Rebirth, and Muse, but after several months of owning this palette I find that I use Aura, Shell, and Divine the most. I use Aura to create an eyeshadow base over my entire eye and also to highlight my brow bone and Â the inner corners of my eyes. I use Shell to highlight my brow bone and the inner corners of my eyes when I want a warmer or more colorful highlight. I often use Divine over my entire eyelid or in the crease of my eyelid. The box that this palette is housed in is very sturdy. I find the colors used and metallic gold accents to be pleasing to the eye. The addition of the picture of Venus from The Birth of Venus painting is just perfection. I’m always drawn to designs that are classic-meets-modern, like this one. To create this look, I used Shell over my entire eyelid, up to my brow bone. I used Rebirth on my eyelid and Venus in my crease. I also used this on the inner corners of my eyes and along my lower lash line, everywhere except for where I applied Aura. I applied Aura on my bottom lash line, under the white eyeliner that I used toward the middle of my eye. Bottom Line:Â I love and recommend this palette because of the rusted shades, how gorgeous they look together, and how long they last. I also love that this palette is cruelty free and vegan. The price isn’t too bad either! Do you have or would you like to get this palette? Agreed, I love the packaging! It’s so pretty! The packaging is simply stunning. And I love the look you created! Thank you!! I absolutely love the packaging too! I had just decided to give up eye shadows but these are soooo tempting. Love the bottom lid look!